We know that your office is just not big enough to have the complete oval office rug from the West Wing of the White House but here is a very plush rug with the Presidential Great Seal in it! A highly impressive piece! Works out nicely for a corporate lobby, law office, your office or your den. 60 inches round. Handmade import-allow 4-6 weeks for delivery time. 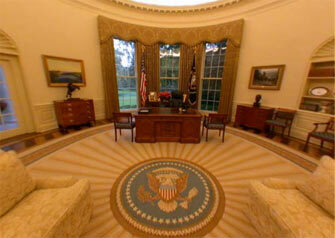 5' Round Plush Wool Rug, seen by millions on Good Morning America, is now available from PRESIDENTIAL GEAR! 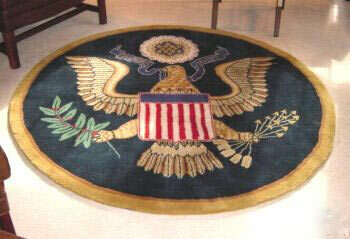 Featuring The Original Great Seal of the United States, this beautiful hand-tufted rug is true in both quality and design, to the American Icon often seen and always admired, in the President's Oval Office. Add this touch of patriotic elegance and style to your office, study or home. Sure to impress your visitors and guests! Highest quality construction with more than one pound of wool hand-tufted in every square inch. The result is beautiful!